San is a graduate of Youkai Academy and the former president of the Newspaper Club who appears in the second serialization. She rarely speaks and carries around a sketchbook to write on instead of talking, and was the one who taught Ginei how to use a camera and stopped him from fighting everyone in his first year. She lives with Marin, who found her after she had nowhere to go. She is a Siren who has a perfect song of protection. However, her true power lies in her offensive ultrasonic which slowly breaks her opponent's body internally. Gin has remarked that San's sketchbook is actually her power limiter. 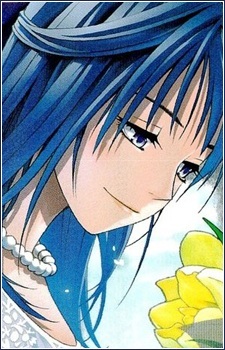 San is also called the "Strongest of the Generations" in Youkai Academy, and is shown admiring Tsukune. Despite her young and petite appearance, she is actually older than the main cast. San's surname translates to "no sound," which is a reference to her quiet demeanor and an irony to her youkai species.